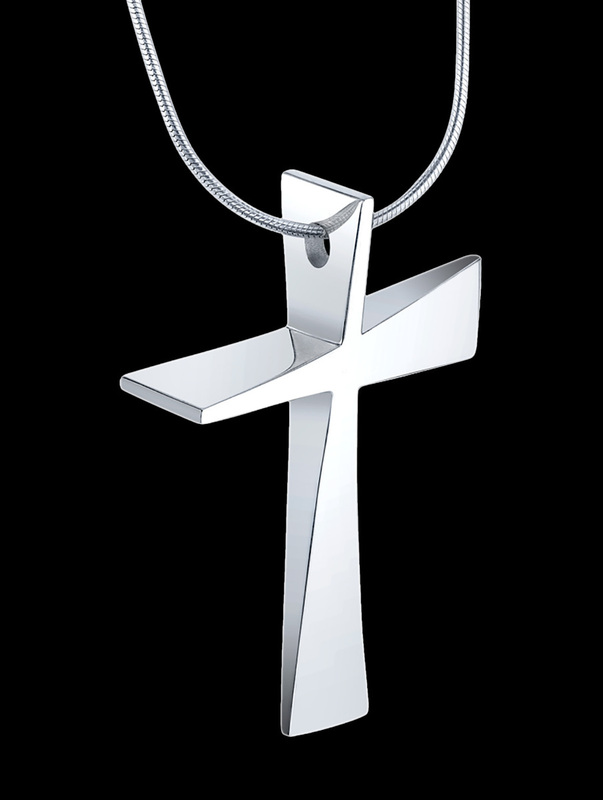 The Trinity Cross solid silver pendant is made by the lost wax method, and is hand cast and hand polished. The design's first incarnation was in clay in 2007 when Los Angeles-based sculptor / jewelry designer Charles Sherman made a free-standing ceramic sculpture with a copper and iron oxide patina. In 2011, Sherman transformed the design into fine jewelry using the lost wax method. He won First Place in the category of Inspirational Jewelry Design for his unique Trinity Cross design at the prestigious JCK Jewelers' Choice Awards international design competition in 2012. The Trinity Cross is composed of eight organically integrated triangles to create its harmonious, unique form. The front view is a triangle that is wide at the bottom and thin at the top; the side view is a triangle that is thin at the bottom and wide at the top. The sacred geometry of the Trinity Cross visually represents the pointing to and meeting of two directions: God's divine love for humanity and humanity's love for God. The pendant comes in 4 different sizes: petite 5/8", small 1 1/8", medium 1 5/8", and large 2 3/8", and a jeweled version, the American Trinity Cross 1 5/8". Each pendant comes with a beautiful, eight sided sterling silver chain in the length of your choice. The Trinity Cross also comes in earrings 5/8", and a two revolution infinity finger ring in sizes 4 - 14.